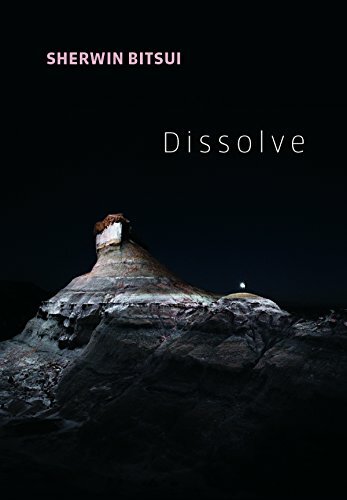 Sherwin Bitsui establishes meditative moods is his latest poetry collection, Dissolve. Each poem, no one of which carry titles, creates a potent mood for its poetic landscape. The writing is so eloquent, imaginative, and spiritual that it seems like an impressionist painting, a painting in which the artistic technique deliberately creates a sensual encounter with nature to invoke human sentiment. Bitsui’s rustic word choice, syntax, and pauses throughout the collection are calculated for each heightened spiritual experience. He avoids abstract emotional concepts, but rather defines them in writing. Dissolve utilizes a diverse array of poems, some of which have uniform stanzas while others flow freely across the page. This is a clear demonstration of Bitsui’s poetic range, his ability to break forms and write unique poems for each subject. This poem is two one-line stanzas (note the gap): “Brushfires graze upon a fleet of soft-footed elk. // Under them—a hush returns, sistering everybody’s blood clots to each other.” The subject of life ending, then reincarnating as a “sister” to earth, is apparent here, so much so that sistering is italicized for emphasis. The poet has created a sense of hope by writing that “everybody’s blood clots,” as if sympathizing with, and justifying, a natural brushfire. The gap between “clots” and “to each other” also demands scrutiny. Why is it there? The gap is there to create a dramatic pause, to reflect upon the brushfire’s impact. It bookends the poem with spiritual, sentimental reflection. It is powerful and justified. At 78 pages, Dissolve is a short, yet very engaging, collection. It demands multiple reads, which is evidence of strong poetry. The natural and gritty images paint dynamic landscapes that balance myth and reality. Strongly influenced by Bitsui’s Native American heritage, the collection fuses cultural storytelling with trained poetics to create a collection of spiritually moving poetry.